Get Ready for Giving Tuesday (November 27)! Parents are invited to attend the next APT General Meeting on Tuesday, November 13, at 5:45 pm. The theme of the conversation will be “Making Room” and will feature OUSD’s Deputy Chief of Equity Chris Chatmon. All parents are invited to attend. Food and refreshments will be provided. Please join OSA on November 27 to celebrate Giving Tuesday! We will be posting some great video clips and messages to the OSA Facebook page throughout the day to celebrate OSA and inspire giving to our awesome school. This year all Giving Tuesday gifts will be directed towards purchasing Chromebooks for the classrooms. We hope to reach $20,000 by the end of the day! Share the OSA #GivingTuesday Facebook posts, or create your own personal fundraiser with a story or picture describing why people should consider giving to OSA. Can I offer Matching Funds to encourage giving? Yes! Facebook now allows anyone to pledge Matching Funds as part of their personal fundraiser! After setting up the fundraiser, click on the More link at the top of the feed and it will have Match Funds in the drop-down menu. Here is how to set it up! Note: All OSA family donations and personal fundraiser gifts will be counted towards their participation in the Annual Fund! Students can sign up through a classroom teacher or on a list inside the front office or Ms. Zaugg’s office. The photo company website will allow you to order. You can view the photo and place an order they will ship directly to you. You will need an access code, but they will give you that as well. For the code, contact customer service customerservice@shootingstarsphoto.com or by calling 800-311-7784 x 0 or 415-695-1011. This year, the middle school dance will be a winter wonderland theme. More details to come! Event: KOSA – The Power of She! Chessmates Club meets every Wednesday from 3:30 – 4:30 in Room 269A. Learn new chess strategies and play against your friends. All levels welcome—including total beginners! Contact tessa.cheng@students.oakarts.org for more information. Mixed People Mixed Problems Article: Cecilia Fontaine from middle school literary arts is looking for people who are willing to be interviewed about their mixed ethnicities for an OSA Telegraph article. She will be talking to every age and every race. Email cecilia.fontaine@students.oakarts.org if interested. Spirit Week: Next week is OSA’s second all-school Spirit Week! The week starts with Primary Color Day (Tuesday), then Hipster Day (Wednesday), then Crazy Sock Day (Thursday) and finally Class Color Day (Friday). All students who dress up will get one bonus point per student to help your class steal the Most School Spirit Award! Also, you can receive double bonus points if you can get a faculty member to dress up! This Week: Raise $$ for OSA, Buy Great Shoes & Boots Locally! OSA’s neighborhood shoe store SoleSpace is again helping raise $ for our school – last year they raised over $2k and hosted the middle school’s Visual Arts show in the Spring. This week all shoe purchasers that mention OSA get 15% off PLUS SoleSpace will donate an additional 15% to our school – Wow! Buy & Browse Sneakers online today at SoleSpace.com – just add checkout code “OSA 2018” and choose free “pick up” option. OR you can Browse & Buy in person at 1714 Telegraph, just around the corner, this Tuesday through Saturday, 12 – 6 pm. Prefer Boots? Visit their 3304 Grand Avenue location by the Grand Lake Theater this Wednesday through Sunday, 12 – 6 pm and mention OSA. Tell your friends and let’s raise some $$ for our school and get some fly kicks! The Circus is Coming to Treasure Island! Discount Tickets for OSA Families! Kaleidoscope, a celebration of diversity and color produced by San Francisco’s Circus Bella, will take place in a big-top circus tent on Treasure Island starting November 30. Kaleidoscope will showcase aerialists, acrobats, jugglers, high wire artists, family foot jugglers, clowns, and more – all performed to original music written by local music legend Rob Reich and performed by a live band. Kaleidoscope runs November 30 through January 6, 2019. Shows are on Thursdays and Fridays at 7:30vpm, Saturdays at 1:30 and 7:30 pm, and Sundays at 1:30 and 6:30 pm. Tickets start at $39. Use Promo Code OSA2018 at www.circusbella.org/kaleidoscope. 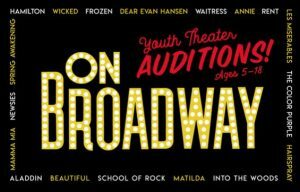 Director and producer John Bisceglie seeks local youth ages 5-18 to star in “On Broadway,” the all-singing, all-dancing, dazzling salute to Broadway! Sing and dance live on stage to hit songs from Hamilton, Wicked, Frozen, Dear Evan Hansen, Waitress, Annie, Rent, Les Miserables, The Color Purple, Hairspray, Aladdin, Beautiful, School of Rock, Matilda, Into The Woods, Mamma Mia, Spring Awakening and more! This exciting 13-week program with only one rehearsal per week makes participating fun and easy for busy Bay Area families. The program will be offered in San Francisco, San Jose, and Morgan Hill. No experience required and all who audition will be accepted. We’re Planning a PODS Retreat and You are Invited! The OSA PODS (OSA Parents of Disabled Students) Group is hopeful that you will attend our very first PODS SOCIAL RETREAT. Our PODS Coffee Meeting was very successful. Thank you to all who came out and all who desired to join us and let us know. We will get you to a meeting soon! The first quarter of school has ended and now we would like to share some quality social time getting to know our PODS families. Please SAVE THE DATE and a formal invitation will follow in the coming weeks. We will also let you know when our next Monthly PODS Coffee Meeting will take place. Please feel free to reach out through email if you want to share your experiences or if you need support with your student and/or suspect a need for IEP/504 Planning.